Well time chages everything and i have had to eat my words on most of these items. 1. I didn't want any gasoline on board the boat because of the risk of fire but I got a good deal on a Honda 1000eu which I have used less than half a dozen times in the nearly 3 years I have been cruising. I should probably get rid of it because I don't need it and it is a fire hazard. 2. I broke down and got a DVD TV at least a year ago and that thing has been terrific. Uses hardly any power, has been reliable and a great source of entertainment. Besides broadcast TV, I watch DVDs on it that you can find for $2 each. 3. When I got my refrigerator, I was not sure if my solar panels would keep up to have it running full time but all I wanted was a cold beverage at sunset and a way to keep my yogurt cold. Well I can say that it has been a roaring success and now I do run it all the time at least on the highest setting which keeps it at about 40 degrees farenheight. I buy ice sometimes especially if it is cloudy to help it along and I do turn the thermostat down during the middle of the day. I don't have a lot of solar, in fact just 260 watts, and I really don't want a wind generator. Those things are heavy and unreliable. I might swap out my solar panels for larger ones when I get back to Florida. 4. I didn't want a bicycle because it is difficult to store on board and riding it can be a little dangerous especially here in the Caribbean where people drive like as the French say "faire une queue de poisson (à quelqu'un.") In other words swerving in front of you like a fish! Well when I was in St Martin, friends of mine gave me a fold up bike and I used it quite a lot. It does take up quite a lot of room under my v birth and the jury is still out on whether or not I will keep it long term. 5 and 6. 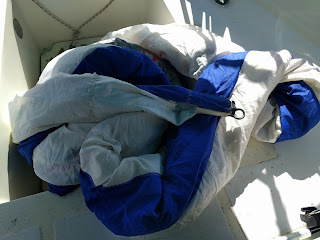 Well today I bought a used asymmetrical spinnaker and a 3 year old Tohatsu 2 stroke 5hp outboard that a fellow cruiser was wanting to sell here in St Anne. Firstly the spinnaker. I REALLY Do not want one. They are an accident waiting to happen especially this one because it is a beast at 500 square feet. The problem with them is that you do not want to be flying it when the wind pipes up because things start to happen. ....quickly, especially single handing. Having said that, there have been times when the wind has dropped to around 5 knots and it is the difference between running the engine and sailing. So my challenge will be to ONLY use it in those situations, and be able to douse it in it's sock before the wind makes it unmanageable. I have in mind the upcoming passage that I am planning at the end of March from the BVI to Cuba. It is a 1000 mile, 10 day passage all downwind where a spinnaker may come in handy. We will see. I will get to try it out in earnest sailing from Antigua to Nevis and then the BVI next month. Now the outboard. This is the number one cause of hassle for cruisers. These things are unreliable. I like rowing everywhere because of the exercise it gives me. The only trouble is, it will be a hassle back in the USA because I will have to register my dinghy. It is handy to have in large anchorages where the dinghy dock is a half mile or more away or the wind is blowing a gale. Right now I am thinking of storing it in the trunk of my car which I have in Stuart, Florida when I get back there in April. 7. Roller furling. 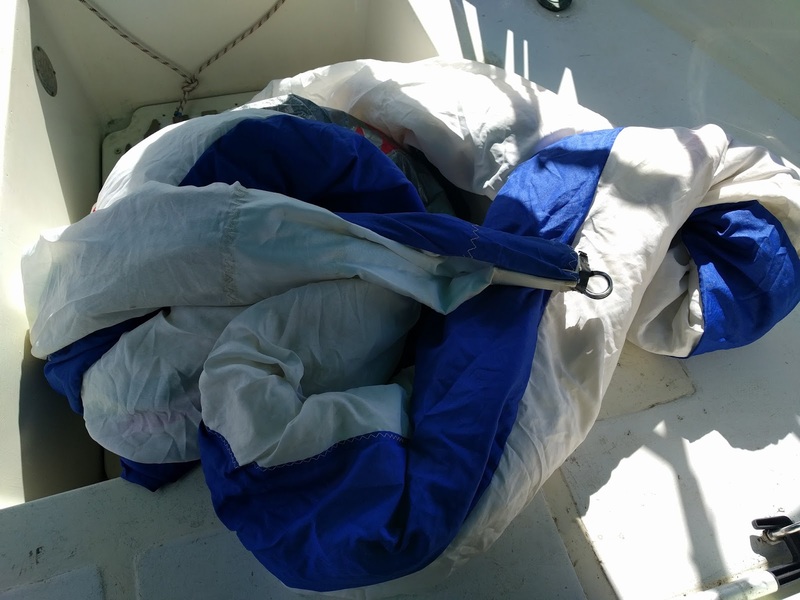 Having a hanked on genoa has caused more than a little consternation at times, but nowhere as much strife as a jammed furler that could sink my boat. Now I am not so sure. I have reneged on all the above 6 so maybe in the future I will get to change my mind on this one. Heck why stop there? Perhaps a Beneteau or even a catamaran is in my future!